Time was against us. The pressure was on. Catch no fish, no dinner. We agreed to our little challenge before we left on our overnight camping expedition. 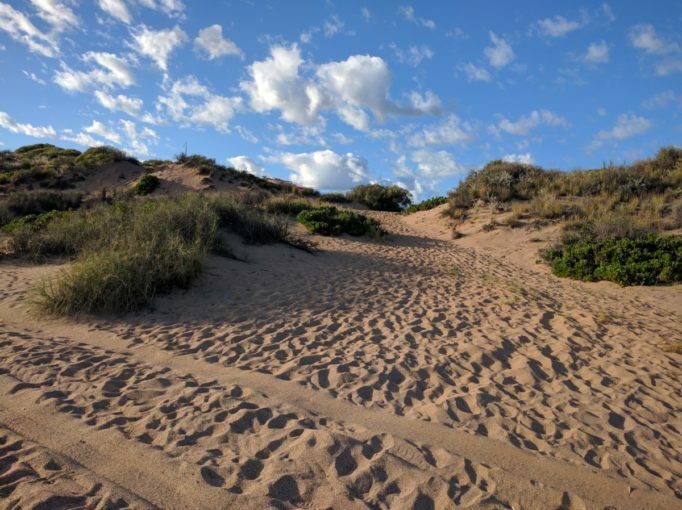 We set off over the sand dunes to the beach. With rods in hand along with two bush chooks, two pre school kids and a dog. 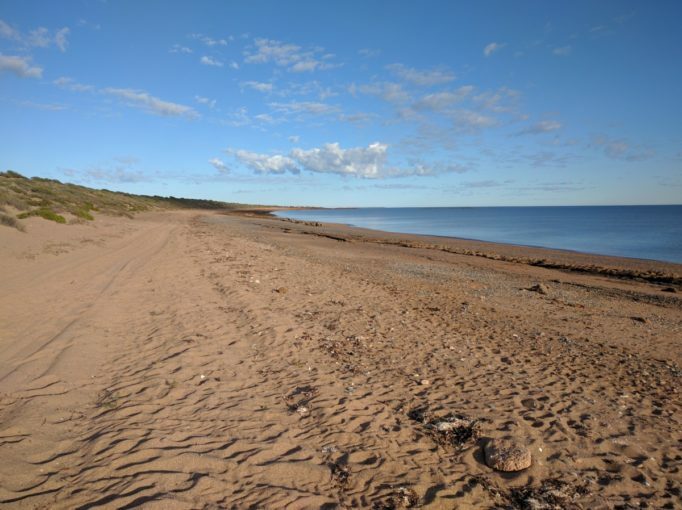 40 mile beach, less than an hours drive south of Karratha according to the widely used Wikicamp app, rates as a popular bush camping spot. It certainly was the case for the predominantly grey nomad population. They were here in force, clearly escaping the colder southern parts of the country. A young German backpacker couple (on their gap year!!) and ourselves were the minority. WA seems to have this extremely effective way of preserving fish stock. To us at least anyway. This also happened on our two earlier “catch no fish no eat” challenge trips. But no matter how dire the situation had looked, we’ve managed so far to come through with the goods. I put this down to the influence of Trav’s eternal fishing optimism. It prompted me to recall the time as a kid he’d come home from school so excited he actually got two words right in his spelling test! In this test of survival our results were similarly locked in with two fish. But no more. No matter how much we persevered into the darkening night sky. However Trav was still just as excited as way back in the days of his first spelling tests. That saying, show me a child of seven and I’ll tell you the man he’ll be, certainly rings true here. Now what better way to compliment our grateful serving of fish as a second course? Yes, if course, that all time camping favourite serving of Parsons rice cream and peaches!! 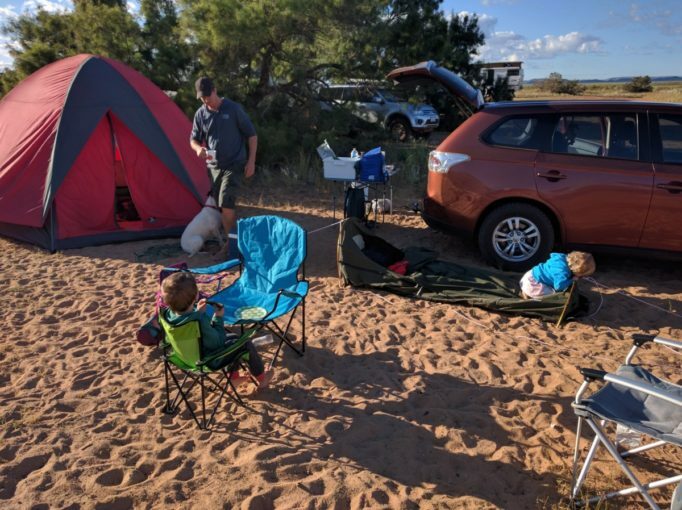 A camp fire, a swag under the stars, a few more tinnies of bush chooks and two little kids in their tent with no TV and no cartoon shows, but who absolutely loved the whole experience… it doesn’t get much better. But more importantly, thankfully, we didn’t have to touch our emergency backup can of baked beans! Hi Chris, great posts, keep them coming. Just back from the Kimberley ourselves so know what you are talking about.